Check this blog post has more details. As always, we look forward to your feedback and feature suggestions! Livid has launched a bundle featuring Liquid Rhythm and the Base controller! Check out their site for more information here. To download a copy of the latest version, please click on the download link below for your system. The list below summarizes the fixes and workflow improvements included in the latest version. Much greater stability with Ableton Live when running Liquid Rhythm in Max-For-Live plugin mode. Any of the download kits can be used to audition the loop library in either Standalone or Plugin mode. Similarly, they can be used as kits for Import MIDI files as well. Using Accent Modifiers from a MIDI Scripting device will high light the targeted notes as they change, to provide feedback on which notes are changing through the accent modifiers. The Shift and Move button driven from MIDI scripting will now appear in the Transport / Toolbar at the top of the application, indicating we are in the mode. In Liquid Clip mode (AKA Liquid Rhythm connected to Ableton Live 9 using Max for Live), a user can now undo/redo/move/copy clip changes without causing Ableton to Crash. Fix undo.cfg error when exiting Ableton Live 9 after using Liquid Rhythm. Voice Editor fixes on Mac when consolidated save is used. Fixed startup issue with device file not being present and opening the settings menu for the devices. Rendering a Liquid Rhythm project to audio (wav/aiff) sometimes caused the rendered file to be corrupt. New UI for the BeatForm Cycler and new name, BeatForm Shifter. Overdub recording mode is glitchy in this version. 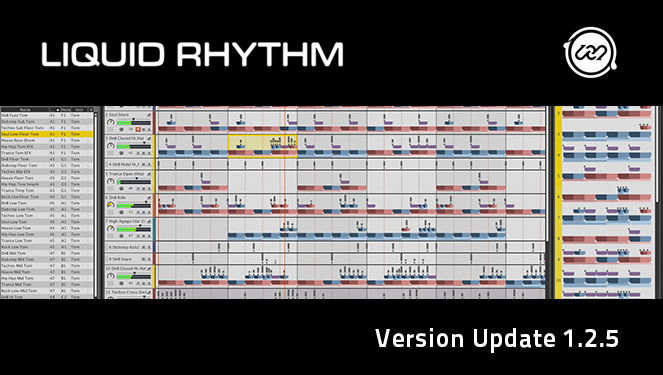 MIDI Scripting for all devices [QuNeo, Base, LaunchPad] is limited to Liquid Rhythm Standalone mode. We are currently working to add support for the other modes. Windows XP: Installer will not install the Ableton Live 9 Max for Live patch. Please follow these instructions here.